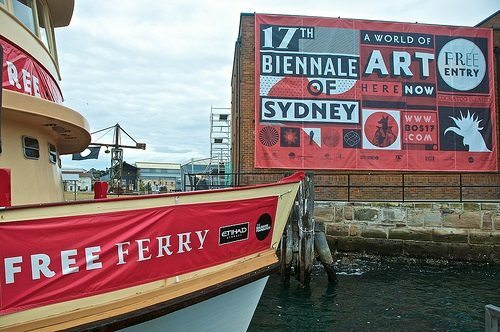 The Biennale of Sydney, an international festival of contemporary art, was founded by Franco Belgiorno-Nettis in 1973, and the services and construction firm he also founded has been a major supporter ever since. However, that firm, Transfield, is also a contractor to the Australian government for the provision of services for its controversial asylum seeker campus. The policy of the current Australian government is to send asylum seekers who arrive by boat to “detention centres” on Pacific Ocean islands like Nauru and Manus, where they often wait very long periods before their claims are heard. (This is the return of a practice, known as the Pacific Solution, which was terminated in 2007 but reinstated in August of 2012.) In July of 2013, Prime Minister Kevin Rudd, took an even harder line, stating that new “asylum seekers who come here by boat without a visa will never be settled in Australia,” forcing them under the terms of a treaty with Papua New Guinea to resettle there even if their refugee status is approved. Last month, riots that broke out in the Manus Island camp resulted in the death of an Iranian refugee under contested circumstances. A number of enquiries are underway to clarify what exactly happened. Twenty-eight artists sent an open letter to the board of the festival, saying, “We will not accept the mandatory detention of asylum seekers, because it is ethically indefensible and in breach of human rights; and that, as a network of artists, arts workers and a leading cultural organisation, we do not want to be associated with these practices.” Ten withdrew their exhibitions entirely. Initially, the Biennale withstood pressure to dissociate itself from its founder’s family’s privately owned business, Transfield Holdings. It is a shareholder in, though not any longer the same company as, the Transfield Services contracted to operate some of these detention camps. The Biennale founder’s son, Luca Belgiorno-Nettis, has now resigned as chair of the festival. This has enabled the festival to sever its links with the name Transfield. It has also cost them a sizeable chunk of financial support, reckoned to be around 6.1 percent of their budget. John is a consultant and trainer to nonprofits. His specialties are major gift fundraising, capital campaigns and business partnerships. John Godfrey has degrees in performing arts, management and marketing . He worked in festival and theatre management in Australia, New Zealand and the United Kingdom before turning to fundraising. Since then he has worked with clients and trained representatives of numerous nonprofit organisations in the UK, India, Middle East, Singapore and Australasia. John has published a popular fundraising book: “Artful Major Gift Fundraising”. Currently he is researching philanthropy in India for a PhD. He lives in Auckland, New Zealand.